The J. League first-stage title may ultimately count for nothing when the championship playoffs begin in November, but that will not stop the current front-runners from wanting to claim the silverware. Only three teams can now win the first stage after a weekend round that culled everyone but Kawasaki Frontale, Kashima Antlers and Urawa Reds from contention. First-place Frontale lead Antlers by a point with two games of the stage remaining, although a six-point gap between Antlers and third-place Urawa hides the fact that the Saitama side has two games in hand on its rivals. The team that wins the stage is guaranteed a berth in the championship playoffs, but with the postseason system skewed heavily in favor of the top three teams in the overall league table, the benefits of doing so are open to debate. With the trophy so tantalizingly close for the three front-runners, however, no one is about to pass up the opportunity without a fight. 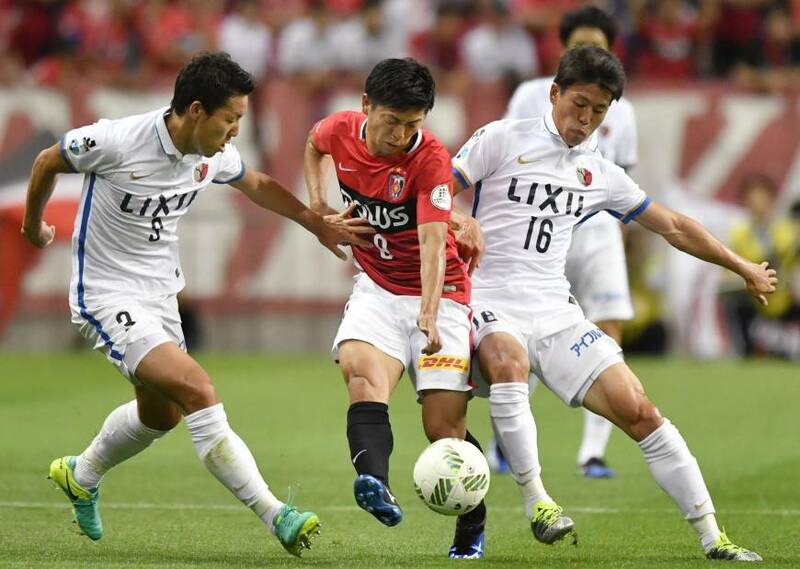 That result means that Reds — who won the first stage unbeaten last season only to fall at the first hurdle in the playoffs — now have a mountain to climb with their remaining four games coming over a 10-day period beginning Wednesday away to Gamba Osaka. Frontale, meanwhile, can wrap up the first-stage title away to Avispa Fukuoka on Saturday if Antlers and Reds both fail to keep pace. Frontale’s on-pitch celebrations after beating Marinos certainly suggested that the prospect of lifting the trophy enthuses the players more than it does their manager. A third straight clean sheet, however, was reason enough to party. Two more repeat performances, and Nakamura will have his hands on the trophy. Usami breaks duck: Gamba Osaka’s results this season suggest their move to Suita Stadium at the start of the year has left them feeling like strangers in their own home. Gamba had lost four out of six league games at their newly built ground going into Saturday’s home game against Shonan Bellmare, with star forward Takashi Usami yet to score a single goal at the venue. A 3-3 draw against lowly Bellmare was not quite what Gamba wanted, but a goal for Usami at least broke the jinx on the 24-year-old ace. 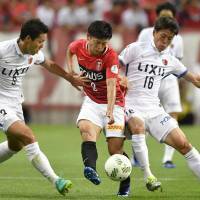 Sendai on a roll: Vegalta Sendai have hardly set the J. League alight this season, but the Tohoku side has been quietly building momentum in recent weeks to move away from the relegation places. Vegalta beat Kashiwa Reysol 2-0 on Saturday to record a third straight win for the first time in two years, lifting Susumu Watanabe’s side six points clear of the drop zone into 10th place. Kashima Antlers’ Brazilian forward Caio reacts to a tweet sent by an apparent Urawa Reds fan saying “Caio, die black man” after Saturday’s 2-0 win for Antlers over Reds.